We are bloody excited to announce that Sydney’s favourite tastemakers Astral People will be bringing their eclectic roster and extended family to the Danceteria for a series of bi-monthly showcases. The aim is to bring together some of the city’s best young talent under one roof without denting your wallet. 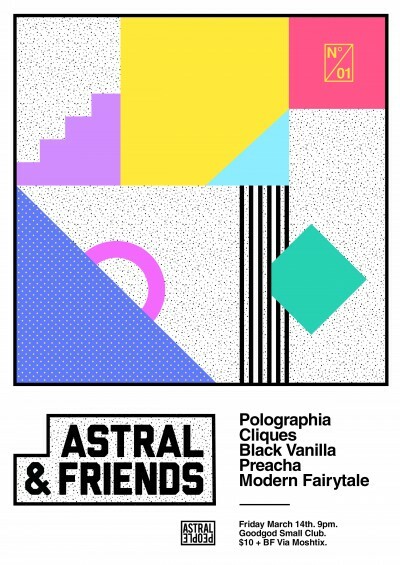 Astral & Friends will offer punters the chance to see some of Australia’s most promising new artists side to side with some of Sydney’s most respected DJs. For our first lineup, Polographia bring their epic electronic anthems to the stage, alongside the trio turning heads Black Vanilla with their ultra-smooth, ultra-addictive brand of electronic R&B. If that’s not enough we also have the always forward-thinking Cliques with one of their infinitely evolving and constantly engaging DJ sets, with Preacha and Modern Fairytale rounding out the night spinning tunes well in to the early hours. These nights are no doubt set to feature some amazing new artists, we suggest jumping on tickets early to not miss out.